Sarah; ex.Rex; ex.Joanie M.; ex.Carol J.
Peter Flint and Caroline Lever acquired the motor cruiser Rex in 2011 and renamed her Sarah. At the time, it was said she was built in 1903 at Broome, but this is looking unlikely. [Sarah] is a 36' jarrah boat which we purchased over 2 years ago. All the history that we were told... has been that that it was built in Broome in 1903. It is a beautiful boat, now restored, not just by us, and has become a very much admired boat that is now moored on the River Murray at Mannum. We have been told that she made her way from Broome to Fremantle, where she was reputably first registered, at some stage made her way across the Bight, worked during the Second World War in the Gulfs St Vincent and Spencer, made her passage through the Murray Mouth, to then spend time on the Murray itself, where she underwent some serious refurbishing to now be a very elegant comfortable cruiser. We are passionate members of the Wooden Boat Association of SA and whilst we have tracked down the previous 3 owners, much to their delight, feel a need to try and trace her history back beyond the late 1980's. We have tried to research archival newspapers from WA and South Australia, but with no satisfaction. It really is a bit of of needle in a haystack exercise which we found rather discouraging. Peter Flint and Caroline Lever. Proud temporary custodians of the now called M V SARAH. Using information provided by Peter and other sources , I have put together a record for the boat, details of which follow. The record contains a list of known previous owners and some other descriptions of her history. Regarding the suggestion that she was built in Broome in 1903, a pearling lugger called Rex was launched at Broome in 1903. However, the form of Sarah's hull does not appear to be the right shape, and in any case the pearling lugger was 2 feet wider. Update 22 Aug 2013: Reference to the British Australian Register entry for the pearling lugger Rex and inspection of Sarah by Michael Gregg have confirmed that Sarah is not the pearling lugger Rex. Notwithstanding this setback, there are some interesting possibilities to further research the Sarah. If Carol J. was connected with Ardrossan, she may well have been in the fishing industry. Records indicate that fishing boats worked out of Ardrossan and Port Pine in the 1930s, 1950s and 1960s. Does anyone at Ardrossan recognise the boat? Update 22 Aug 2013: Information provided by Michael Gregg indicates the scantlings of the Sarah are quite light and so she is unlikely to have been built for fishing. This does not preclude her being used for fishing at some stage in her career. 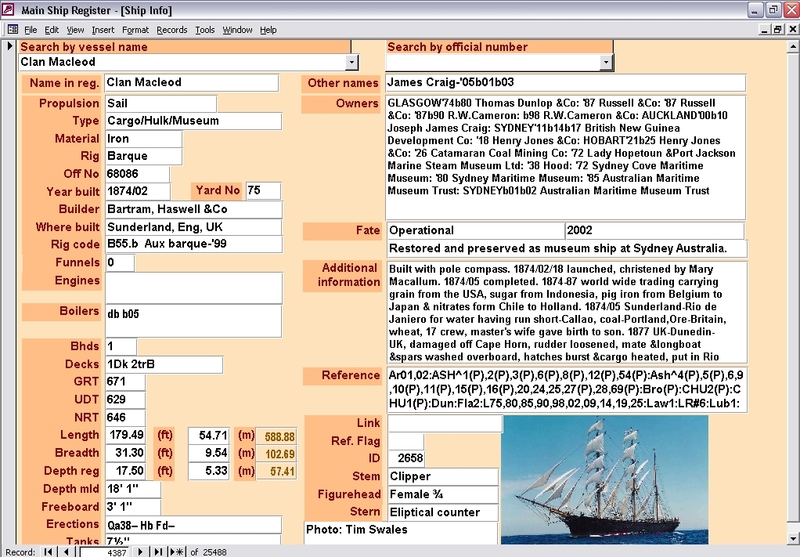 A fishing vessel called Carol J. did work in South Australia. According to Gifford Chapman's Wooden Fishing Boats, the Carol J. was built in 1958 at Tumby Bay, SA. Inspection of the photo in his book indicates it was not the same vessel as it had a rounded stem, though it is listed as 36' long and 10' beam. Could the 1958 Carol J. have replaced an earlier boat of the same name? The hull of Sarah other than the stern is quite similar in appearance to a 30' fishing boat Arangi built by Squire Britton at Kingscote, Kangaroo Island in 1930. Could she have been built by Squire Britton or another builder at Kangaroo Island? Under the names Carol J., Joanie M. or Rex the boat has been in the Goolwa area for some time. Is there anyone at Goolwa who would remember the boat from its early days? Do you know anything about the story of the Sarah / Rex / Joanie M. / Carol J? The Sarah has the rudder mounted on the transom rather than being located beneath the stern. See photo at the bottom of this webpage. This feature is quite distinctive and may provide the trigger to help in recognising the boat or her builder. If you have information or ideas, then please contact Mori Flapan by email. History and details: Carvel jarrah planked. Rudder hung from transom. 2' 8 " draft. Approx 7t displ. Three portlights each side of RFD. 1940s(mid) came into SA Gulf waters. 2' 6" draft. 1950s fitted with raised foredeck &converted to motor cruiser, 4 berths, Cb+Cw+RFD, 1mast @ 3. 1956 repowered at Ardrossan, transferred to Goolwa. c1983 fitted with new motor, 36bhp Volvo Penta MD17 diesel. 1990s(?) recaulked at Goolwa slip. 1998 new owner worked at Veenstras Capt Sturt marina, placed in marina shed. c1998-2004 underwent a major rebuild by Freshwater Marine of Capt Sturt Marina in Goolwa, stripped bare, extensive hull work, new services, aft cockpit rebuilt in jarrah, fitted with winch. 2004 sold 85% completed. 2007 participated in SA Wooden Boat &Music Festival. 2008 at Hindmarsh Island. 2008/03 for sale. 2010 transported by truck to Greenings Landing 10 km above Mannum. 2011/03 purchased at Greenings Landing. As Joanie M. attending the Goolwa Wooden Boat Festival prior to 1998. The photo shows the deckhouse prior to alterations. Photo: Joanne Tredea.